Note: Sequences and Rules are legacy features and are not enabled by default in new accounts. We strongly recommend you use Campaigns instead of Sequences and Rules. This documentation is provided for legacy clients still using these features. Sequences (commonly referred to as autoresponders) are a series of steps that a contact is taken through. The steps can be an automatically delivered communication to the contact (emails, postcards, sms, etc.) or a reminder to you or someone else in your company to call the contact or to perform some other task. Each step is completed on a time-released schedule of your own design. Once contacts are subscribed to a Sequence, they will begin receiving the steps as scheduled by you. Although fundamentally all Sequences work the same way (automatically performing actions or steps on a pre-arranged schedule), ONTRAPORT features two different types: Step Sequences and Date Sequences. The way in which you schedule the steps on your Sequence depends on the type of Sequence you’re creating as both types of Sequences are used for different purposes. Step Sequences work much the same way as "auto-responders" or "drip email" processes. Step Sequences start on day 0 when the contact is subscribed to the Sequence. Every contact always starts at the first step, and moves step-by-step through the Sequence. A contact recently subscribed to a Sequence may be on step 1 while someone subscribed weeks ago may be much further along in the process. Steps are scheduled in increments of days from the previous step. Therefore, if the first step fires on day 0 and the next step is scheduled for five days later, that second step will go out on the fifth day. If the third step is scheduled for five days after that, the third step will go out on the 10th day from when they were subscribed, and so on. In Date Sequences, all contacts subscribed go through the steps based on the date specified, NOT based on when they were subscribed. If a contact is subscribed to a Date Sequence after the dates for the first two steps they simply skip them; they will start with the next upcoming step. The dates you use can be a specific calendar date, such as February 14th. Or, you can use any date field in your Contact database such as birthday, a membership renewal date, etc. The step can optionally be set to fire every year, and you can offset the step to fire up to 30 days before or after the target date. You have an event planned in six months and will accept registrations up to the date of the event. You want to acknowledge any contact who registers right away, no matter when they do so. For this action, create a Step Sequence that sends the thank you email on "Day 0" (the day they register). You also want to engage the contacts who register early. But you don't want to overload them with dozens of emails if they register one week before the event. And you don't want to have to un-subscribe them manually so they don't get dozens of emails after the event is over. A Date Sequence is ideal. You can even use a Rule Step in the Step Sequence to subscribe them to the event's Date Sequence! In the Date Sequence you can set reminder messages to go out on specific dates, perhaps starting once a month at first and then weekly during the last 6 weeks. And, starting a few days before the event, send a daily email. A contact added to this Sequence six months in advance receives all your nurturing messages, but one who starts a week in advance skips the prior messages, and receives only the messages dated after the subscription date. When combined, you have automated your event welcome Sequence; every contact gets an immediate "thank you", and joins the Date Sequence at the appropriate point. And after the event you don't have to worry about ill-timed messages about an "upcoming event" that is in the past! The Sequences Collection lists all the Sequences created in your account. 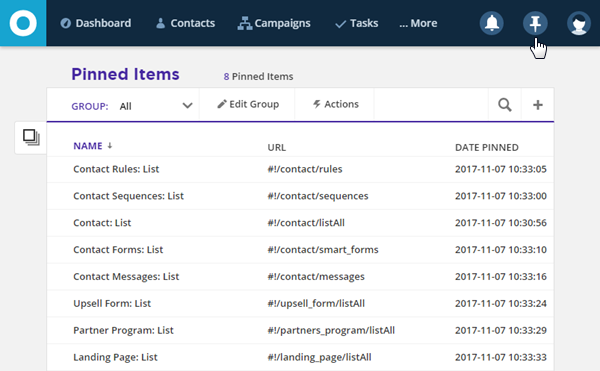 Just like the Contacts Collection, you can click the item to open it for editing, select one or more items for Actions that appear in the Action Bar, create Groups and apply Group Actions to all items selected in the Group. Pause sequences with active subscribers prior to editing. Pause the sequence by selecting it from the Collection view and selecting Pause in the Actions menu. After editing, repeat this process to Resume the sequence. To add a step, click one of the Add a Step icons across the top of the sequence edit window. Steps are added at the end of the sequence. To delete a step click the trash can icon at the right. To move a step, click the position icon and drag the step to your desired location. Note: We do not recommend moving steps in a Step Sequence that has Contacts on that step. Contacts will move with the step, changing their position in the Step Sequence. This means they will either skip or repeat steps based on the new position. Contacts who have already completed that Step will repeat it if the Step is moved to later in the Sequence. This setting allows you to set the steps on your Sequence to fire only on weekdays (Monday through Friday), skipping Saturdays and Sundays. This is where you indicate whether you'd like someone to remain on the Sequence after the last step has fired for them, or to have them removed from it. If you want it to be possible for a contact to end up on this Sequence again, then select this option. 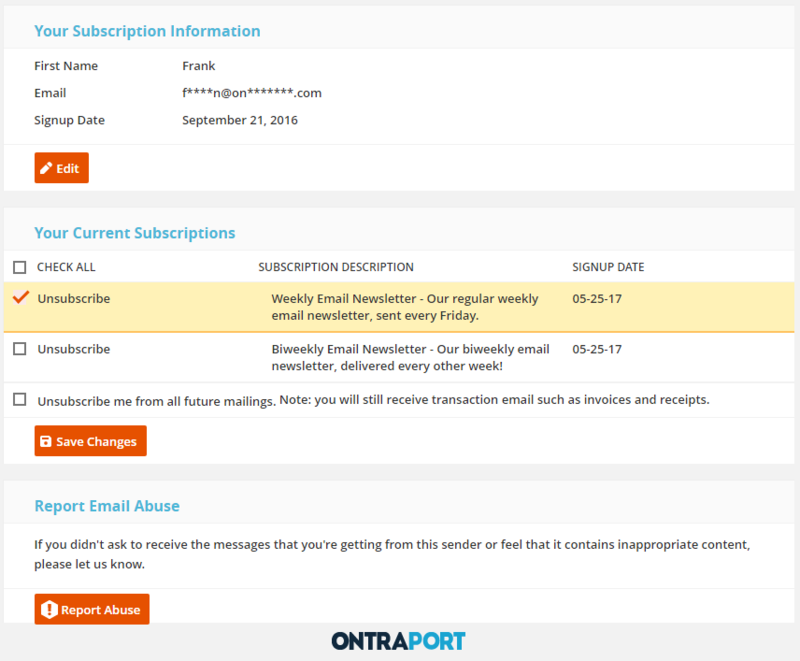 ONTRAPORT keeps track of a contact's place on a Sequence even if they are "re-subscribed" while on it. This prevents them from repeating steps and, as an example, receiving duplicate emails from email steps. When a contact is unsubscribed from a Sequence and then re-subscribed they go through each step again. If you do not want a contact to go through the Sequence again, leave this option unchecked. 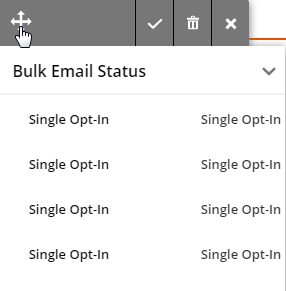 When checked, this will show the Sequence on the subscription management page so that a contact can opt out of this specific Sequence if they choose to, allowing them to choose something other than the default "Unsubscribe me from all future mailings" option. You should check this box for all marketing type Sequences, however, if there's vital information that customers must get in order to fully make use of a product they've already purchased, or say, emails letting them know about the time/date of a webinar they've signed up for, then you should leave this unchecked so they don't accidentally opt-out of it. Using ONTRAforms and ONTRApages with Forms: You can set the Form Settings to automatically add anyone who fills out the form to any (or all) of the Sequences in your account! See the section Manage Form Fills in our Knowledge Base article for more information. 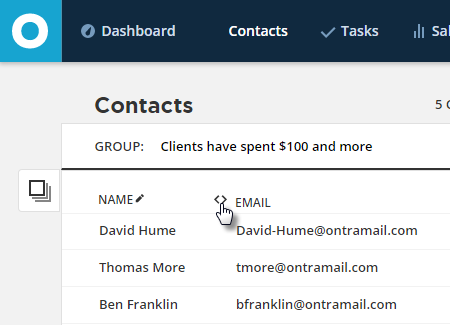 Using Legacy Smart Forms: Like ONTRAforms and forms on ONTRApages, you can set up Smart Forms to automatically add anyone who fills them out to any Sequences in your account. See the "Adding Contact Tags, Sequences, and Rules to Form" section in the Smart Form Builder Overview article. Using global Rules: Automatically add contacts to your Sequences based on all kinds of events or actions using global Rules. Using Rule Steps:Rule steps in Sequences can add a contact to another Sequence; you can add optional conditions to filter the contacts added. 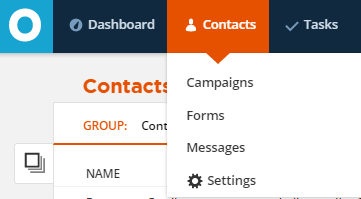 You can add a single contact, or a Group of contacts, to a Sequence manually. See the section Performing Actions on Your Contacts in the Contact Management Overview article. 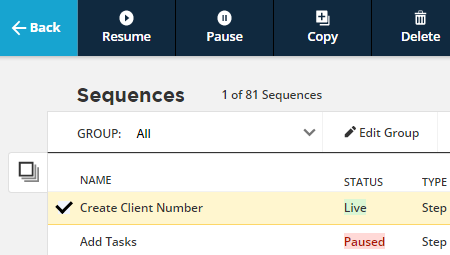 Removing contacts from sequences can avoid having dozens of entries in the Sequences section of the Contact Record, and enables the contact to start the sequence at the beginning again. Using ONTRAforms or forms on ONTRApages: Use Rules on your forms to remove contacts from Sequences when the form is submitted. You don't have to worry if the contact isn't on that sequence already; ONTRAPORT doesn't create an error and just ignores the request. This is a great way to remove a contact from a "prospect" sequence in preparation to adding them to a "buyers" sequence. See Always On and Conditional Rules in our ONTRApages Knowledge Base article for details. Using Legacy Smart Forms: Use Rules in the settings of your Smart Forms to remove contacts from Sequences based on a form fill-out or if a particular Field is selected. See Using Smart Forms for more information. Using global Rules: Automatically remove contacts from your Sequences based on all kinds of events or actions, including purchases made, page visits, or subscription payment failures. See the Rules Overview article for more information. Using Rule Steps: Schedule a rule step within a Sequence to remove a contact from the current Sequence or another Sequence if the conditions of the Rule are met. See Using Rule Steps in the Adding Steps to a Sequence article. After the Last Step: Select Unsubscribe contact after last step in a Step Sequence's Settings to remove contacts automatically when they finish the Step Sequence. Date Sequence Removal: Remember that to remove a contact from a Date Sequence, you can use a Form Rule, Global Rule, or Rule Step, or remove them manually (there is no "Unsubscribe contact after last step" option for Date Sequences). You can remove a single contact, or a Group of contacts, from a Sequence manually. See the section Performing Actions on Your Contacts in the Contact Management Overview article. Do you always want to remove a contact from a sequence? No! One great reason for leaving everyone on a Step Sequence is that they never repeat the steps. If they re-opt in on a form you don't send them the "welcome" email again, or provide another free trial membership to your exclusive content. For evergreen Date Sequences, like a "Birthday Greeting Date Sequence" you would want the contact to continue to get the greeting every year. Why is my Contact stuck on a Step Sequence? A. If they are in the middle of the sequence they may be paused by a Rule. Check the Automation Log in the Contact record; it is on the Contact History tab. If the contact is on the last step that is normal. By default Contacts remain on sequences “forever” unless the “Unsubscribe contact after last step” option is chosen in the sequence’s Settings. How do I set up my Step Sequence to run all the rules before the email fires? A. Steps in a step sequence fire in order; make sure your Rule adding the information is first (at the top) in the Step sequence. My Step Sequence is sending blank usernames and passwords! A. Make sure you have a Rule step prior to the email that grants membership to the Contact. Why am I not on the Step Sequence when the form puts me on it? A. By default, Contacts remain on a sequence even after all steps are completed. However, you can have a Step Sequence set to “Unsubscribe contact after last step” (in Settings), or a Rule can unsubscribe a Contact from a sequence. Check the Automation Log in the Contact record on the Contact History tab for the unsubscribe event. As well, if the Step Sequence sends an email you can check the Contact Log to see if the email was sent. Which sequence sent this client this email? A. Check the Contact Log in the Contact record. It is on the Contact History tab. You can add the header column “Sequence” to see the originating sequence at a glance. How did this Contact get on this Step Sequence? A. Check the Automation Log in the Contact record. It is on the Contact History tab. You will be able to see the subscription event if you search for the sequence name. If I add an Email step to the end of a sequence set to fire “Immediately” when will my contacts already on the sequence get the email? A. When the first step is set to fire immediately a Contact will have it fire immediately after they are added to the Sequence. For optimum performance all other steps set to “Immediately” are pre-compiled the night before and fire at 10 A.M. Adding a step at the end of the sequence, set to fire “Immediately” will actually fire the next day at 10 A.M. ONTRAPORT uses the account's time zone for this function. How can I add a step and send the message the same day? A. Use a defined time one hour or more in the future. The step will then compile and send the email to all Contacts on that step at that time. Later, you can choose to change the time or set the step to “Immediately”. How can I add a step in the middle of a Step Sequence? A. Pause the Step Sequence, add the step, then move it into position, and then Resume the Sequence. To pause the sequence, select it in the collection view and select Pause in the Actions menu. Remember to unpause the Step Sequence when done editing by selecting it in the collections view and selecting Resume from the Actions menu. If you do not pause the Step Sequence some contacts may progress to that step as soon as you finish editing it. Then, they are moved in the Sequence with that step when you reposition it. They will not only have the action taken by that Step, but then repeat all the steps after that new step. In a Step Sequence, what does “Immediately” mean if the step is set to fire the next day? A. The step will fire at 10 A.M. the next day (using the account's time zone setting in the Aministrator's profile). What happens if I delete a step and my contact is on that step (but it hasn’t fired yet)? A. The contact advances to the next step. If the deleted step was the last step in the sequence the contact’s position is set to the prior step (the new “last step”). What happens if I rearrange the steps in my Step Sequence? A. Steps fire in the order they appear in the Step Sequence. We don’t recommend changing steps while Contacts are on them. Any Contacts on that step will move with the step, so they will skip steps or repeat steps depending on which way the step is moved. Moving a step to the end of the Step Sequence will cause it to fire again for Contacts already past it, and will move Contacts on that step to the end of the sequence, skipping the other steps. My Contact received an email from the Step Sequence twice! A. Did you move the step in the sequence? If the step is moved to a later position it will fire again when the Contact reaches it. Can I put a Contact into a Step Sequence in the middle? A. No, Step Sequences are automated and your contacts will always start on step one. You can copy a sequence and delete the first steps, then subscribe the Contact to that sequence. Can I have a Contact skip a step in a Step Sequence? A. Step Sequences are automated so you cannot “push” a Contact into the next step or start them on anything but the first step. However, you can have Rule steps that check for a condition and act on the Contact only if that condition is met. An example is sending a Contact an email about your new basketry course if they have the Tag “Basket Maker”. The Rules in my Step Sequence are not firing. A. Make sure the Rule does not have a Condition that is preventing it from firing. Some of my Contacts were supposed to be put on a Step Sequence but aren’t there. What happened? A. Check the “trigger” for adding them to the Step Sequence. If it is a global Rule, make sure it is not paused. If it is a setting on a Smart Form, make sure the Contact completed that form. Check to see if the Step Sequence has “Unsubscribe contact after last step” checked off in the sequence’s Settings. My Step Sequence is set to send a message after 3 days, but sometimes it sends it 5 days later. A. Check the Step Sequence’s Settings to make sure the checkbox for “Run this sequence only on weekdays” is not checked. My Contacts keep getting the same email from the Step Sequence! A. Ensure the check box in the Step Sequence’s Settings to “Unsubscribe contact after last step” is not checked. If it is, and something adds the Contact to the Step Sequence again such as a form fillout or a Rule, they will repeat the steps. If they remain subscribed to the Step Sequence you can induce them to repeat steps if you move a Step they are on to a position before those steps. Check the Automation Log in the Contact record, on the History tab, for clues. An email step isn’t working. The Rule steps before and after it have run 842 times but the email has only been sent out 750 times. A. The Email step reports the number of emails actually sent. Check to see if some of your Contacts have a Bulk Email Status of Opt Out or Hard Bounce. What if I rename a Step Sequence, delete half the steps, add 12 new steps, then rearrange them, delete some more and then duplicate previous steps that I deleted before, inserting them between steps that have already fired for most of the contacts and switch everything to only fire on weekdays? Current date is January 15. I edited a step in a Date Sequence from January 2 to January 20 and it didn't send to my contacts. A. Steps in Date Sequences honor the date, and the new changed date is now in place. The step will be active on January 20. The Rules in my Date Sequence did not fire first, even though I moved them to the top of the stack. A. Steps in a Date Sequence fire based on the date only, and do not follow the “order” in which the steps are displayed. For a Rule that will always fire regardless of the date use a Step Sequence, a Rule on the opt in form or a global Rule. The Rule in my Date Sequence has a date now in the past and isn’t firing for my subscribers even though it is the first step! A. New Contacts subscribed to the Date Sequence skip any step with a date in the past. To have a Rule that acts without regard to a specific date use a Step Sequence, a Rule on the opt in form or a global Rule. My birthday sequence is not firing! A. Make sure you have checked the “Run this step every year” checkbox. I want to send a birthday greeting but I don’t want to change the birth date to the current year each year. A. Use the actual birth date and set the birthday Email step to “Run this step every year”. It will run on the month and day each year and ignore the year. I want to start someone in the middle of the Date Sequence. A. There is no need to do this. A new Contact added to a Date Sequence simply skips all dates that are in the past, so they will always be on the same step as everyone else in the sequence. I want to send an immediate “welcome” email as part of my Date Sequence. A. Date Sequences send based on a calendar or system field date. You can use a Step Sequence to send the welcome message immediately, or use a Rule on the opt in form to send the message when they sign up.